This beautiful gown by George Elisa is a breath taking silhouette. It's everything a princess can ask for on her wedding day. 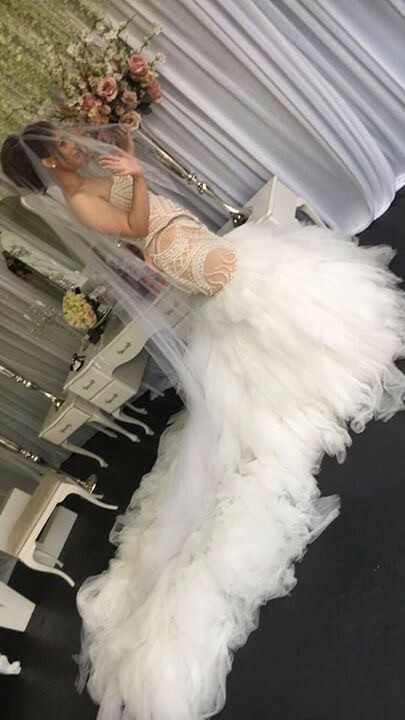 The dress has been custom made with hand detailed pearl embroidery throughout the bodice straight down to below the knee adding beautiful flare kick to the floor and a beautiful mermaids trail. This beautiful gown comes with an under skirt to enhance the flare of the dress and also an over piece skirt to give it a breath taking princess look upon entry. It will be a pleasure to pass this on to another beautiful bride yet heartbreaking to let it go. This can be easily altered to fit you as the deaigner has left room from the back so it doesn't jeopardise the style of the dress. Once you send a message, FIf can invite you to purchase the dress.